According to some in the medical field, maybe it should. In a survey of 238 medical students at King's College London School of Medicine, 87 percent said they thought the subject of medical ethics was important, with 52% ranking it as “very important” to their professional practice. Navigating ethical challenges can be one of the most difficult aspects of being a doctor—largely because it’s one area usually not addressed in a typical medical school education. Here are a few reasons why medical students (and even existing doctors) may want to consider enrolling in a medical ethics class. The ability to communicate with patients and their loved ones is not only crucial to success in patient satisfaction—it’s a critical part of your job. Delivering news, asking questions that guide you toward a diagnosis and explaining procedures and care plans are all duties you perform on a daily basis. However, for some people, being a stellar communicator doesn’t come naturally—it’s something you develop and refine over the course of your career. Ethics classes help you understand how other people think through decisions and form their beliefs. This knowledge can help you communicate in a way that resonates with patients and steer clear of saying things that may inadvertently anger or offend them. 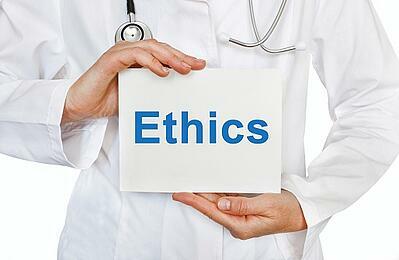 Medical ethics issues are generally gray areas, which means there may not be a clear-cut answer. However, a medical ethics class can equip you with the tools you need to work through these challenges, identify various outcomes, weigh the pros and cons and make an informed, logical decision. While it may not necessarily make the decision-making process easier, it will give you a process you can apply to each independent situation you face in your medical practice. As a doctor, you’re required to put your personal beliefs aside to do what is in the patient’s best interest. Your stance on controversial medical topics cannot weigh on your ability to provide your patients the care and treatments they may want or need. But, for many medical professionals, this can be a challenge. Medical ethics courses teach you how to effectively consider opposing views, better empathize with people who believe differently and advocate to ensure they’re receiving the best treatment possible. This will not only improve the quality of patient care but may also lead to more productive discussions with peers who have opposing views. Ethics in medicine is a challenging topic, and even with formal ethics education, there’s no way to adequately prepare for every issue you’ll face on the job. However, by taking a medical ethics class, you can equip yourself to address concerns in a professional, empathetic and informed manner.